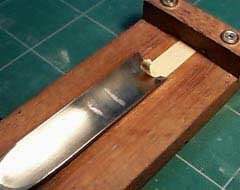 Place the slip on the shooting board and gouge. Not to much though it is only meant as a guide for the sanding block. Start 1/2 way down, flip the slip over and repeat. You'll end with something like this. 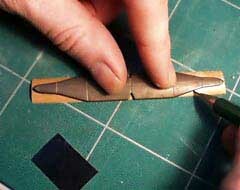 If you find the gouging difficult at first, make sure you don't gouge to deep because this will make the slip useless. 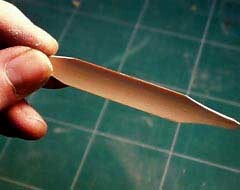 The thickness along the center is ± 1,6 mm. 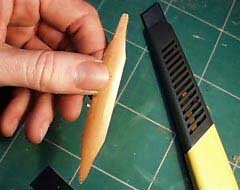 I find a template as shown on the picture very handy when you make a lot of reeds. Here are the measurements if you don't use a template. 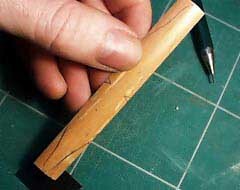 Make the inside black with a very soft pencil. Use your fingers to rub it in. 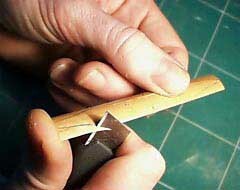 When sanding the profile on the sanding block the pencil will tell you if there are spots you've missed. 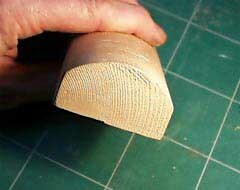 A sanding block with a 82 mm diameter is used to profile the inner side of the reed. 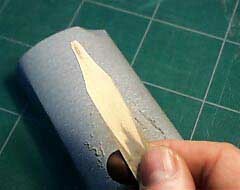 Wrap a fresh piece of sandpaper around the sanding block. 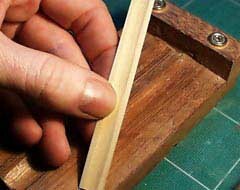 Place the slip on the sanding block and start sanding the first half of the reed. Don't put to much pressure on the slip let the sandpaper do the work. Keep checking and when the first half is done flip the slip over and do the other half. 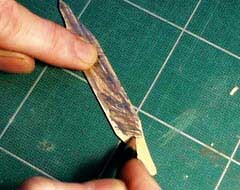 When you are finished and there are no more pencil marks left the thickness of the slip is between 1,4 mm and 1,5 mm. This picture shows the profile after the sanding is done. 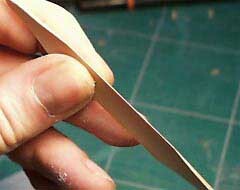 Notice the very thin edge on the side of the reed. VERY gently sand the sides of the slip. No more than two or three strokes. Just to make it parallel again. Check if the sides are even. If not give it few extra strokes on the sanding block until they are.